Here's a very good starter eyepiece that won't break the bank! With a 1.25" barrel and 20 mm focal length, this compact and lightweight eyepiece gives bright, crisp, and wide-angle views of the Moon, planets, and deep-sky sights with any telescope. High-index glass with broadband multi-coatings enable a wide 65 degree apparent field of view with excellent color correction and minimal image distortion. Blackened lens edges and anti-reflection threads ensure maximum image contrast. Viewing position can be adjusted with fold-down rubber eyecups. Made from black anodized aluminum, and the base of the barrel is threaded for standard 1.25" filters. To minimize the need for refocusing, this eyepiece is parfocal with other eyepieces in the same series. 4.6 (Based on 7 Reviews) 100% of reviewers recommended this product. I am using this eyepiece in my 60mm long refractors while searching out Messier galaxies from my suburb home. I am getting a nice, sharp image to the very edge of the field and a nice sharp field stop. The eyepiece is light, which is what I need for these small scopes. Review by Composer of Nashville, TN. 5.0 Agena Wide Angle pretty awesome! Great lens on my Celestron C90 (Orange color made in the USA in the 80's! )Astronomy and nature. Review by CyberELF of Becker, MN. This is a good deal, nice product and a decent price!! Review by wrose of Colorado. Review by nam2525 of Washington. 1. Agena AstroProducts WA 20mm 65-degree AFOV. 2. William Optics SWAN 20 mm 72-degree AFOV. 3. Celestron E-Lux 25 mm 52-degree Plossl. FOR THE SHARPEST VIEWS, I MUST WEAR EYEGLASSES FOR MY VISUAL OBSERVING!! (I have astigmatism.) My final choice is based on having to use glasses. ** 4-inch APO F/8 with and without Powermates and with and without Binoviewer. ** 3-inch Orion ST80 F/5 without Powermates and without binoviewer. 1. To find a general all-purpose eyepiece that can stay in the binoviewer (only adding Powermates for more magnification). 2. See if there was a difference between 65 degrees AFOV and 72 degrees AFOV.....THERE WAS A SLIGHT DIFFERENCE but not worth the price of the SWAN. 3. See if there was a difference in brightness between 4 lens elements (Agena) and 5 lens elements (SWAN).....THERE WAS NO DIFFERENCE THAT I COULD DETECT. Others might see some...if there is a difference, it is probably slight. Both wide angles vignette slightly in the binoviewer. The plossl does not. No eyepieces vignette when used alone (without binoviewer). ***Agena AstroProducts WA 20: This is fully multicoated and has blackened lens edges....THAT ARE REALLY BLACKENED!! It comes with end caps and bolt cases. The quality of the glass and coatings seems excellent. The eyepice housing is basic. The barrel of the eyepiece is a chrome type with no safety groove or sloped design. Some dislike the safety groove, others prefer it. The eyelens (the lens closest to your eyes when viewing) is recessed in the housing a bit...this helps protect it from scratches but also makes it a bit more difficult to use with eyeglasses, and with glasses on you can't see the whole field of view....but you get most of it. No internal reflections, and no scattering of light from the eyepiece barrel (when looking through the eyepiece while holding the nosepiece or barrel towards a bright source of light). There is also no ghosting. Briefly about the SWANs: Poor quality control and I paid more for it....go figure!! FIRST SCOPE: 4-inch F/8 APO with and without Powermates and with and without Binos. With the scope at F/8, both wide angles eyepieces have coma starting at about the outer 35% to 40% of the field of view.....but not annoying. I preferred these wide angles to the narrow field of the plossl, even though the plossl was sharp to the edge. With Powermates, both the Agena and SWAN behaved better near the edge of the field (coma evident at about the last 20% of the field), and gave clear and sharp views of Saturn, with Cassini division being seen. Some slight false color appeared if you moved your head out of the "sweet spot", but both had a more generous sweet spot than the lowly E-Lux plossl. All in all, the wide angles gave great views. As for True Field of View, the Agena was showing about 1.6 degrees of the sky....the SWAN was showing about 1.75 degrees and the 25-mm Plossl was also showing 1.6 degrees of actual sky. SECOND SCOPE: The lowly 3-inch Orion ST80 F/5. Severe coma in the wide angle eyepieces starting at about 50% of the way to the edge....at the edge, stars were elongated and it was a bit annoying....True Field of View was over 3 degrees for both the Agena and the SWAN!!! Because this is a fast scope with bright views, I could actually see more stars (by this I mean faint ones) using this little scope than I could see in the 4-inch APO. In spite of the bad coma, I preferred the wide field of the Agena and SWAN as opposed to the E-Lux which was narrow but sharp to the edge. SUMMARY: The Agena and SWAN are not the best choice for fast scopes (try a Plossl but not the E-Lux....get a better quality Plossl). If you DON"T need to wear eyeglasses, then the Agena WA 20 is a good choice for medium to slow scopes and it provides a very usable field of view. You can use glasses with the Agena WA 20, but it is a bit more difficult and you can't see the entire field of view. If it hadn't been for my need to wear glasses, I would have kept the Agena WA 20. After reading the review on this eyepiece by nam2525, 04-May-07 I was happy to have a chance to try the AGENA AstroProducts WA 20mm myself. I agree with the reviewers findings that it is an excellent value for the money in a medium to slower focal ratio scope. The quality of construction is very good, with a well built body and barrel; no plastic or light weight feel. The eyepiece has a 65° AFOV, Lens edges are blackened, and the lenses are fully multicoated. As indicated I found the eye relief is close to the stated 20mm but with eye lens recessed in the body about 5 or 6mm, the useable eye relief is probably only 15mm. That's a little tight if you wear glasses. This eyepiece is sharp on-axis and has reasonable edge performance for an eyepiece in this class but does have coma in the outer 1/3. As expected, the faster the scope, the greater the coma. Viewing planets and the Moon provide very nice views with little if any internal reflections or scatter and only mild coma being noticed in the outer 1/2 of the field. The on-axis view provides very good contrast and detail. On Venus there is no scatter or ghosting and the sky background is well darkened but not so stark as to indicate poor light through put. Switching to Globular Clusters the eyepiece gives nice pin point stars in the central 1/3 of the field which give a pleasant Airy Disk when rolled through focus. The mid 1/3 of the the AFOV moving toward the edge provides pleasing views in an f/9 scope but does start to show signs of aberration in an f/7. The Outer 1/3 of the AFOV has noticeable issues in the f/7 and is definitely not good in an f/5 refractor. Overall the Agena 20mm WA is a good eyepiece for the price. If you're looking for an alternative to the Plossl with a wider AFOV, this would be a good choice in a slower scope. I would not recommend it for scopes faster than f/7 or f/8. While the on-axis viewing is very good the outer portion of this eyepiece does exhibit coma and mild astigmatism. So if you're sensitive to coma, you might want to look at the 20mm Superview. The Agena WA 20mm would probably be a great choice for binoviewing, if you don't wear glasses. 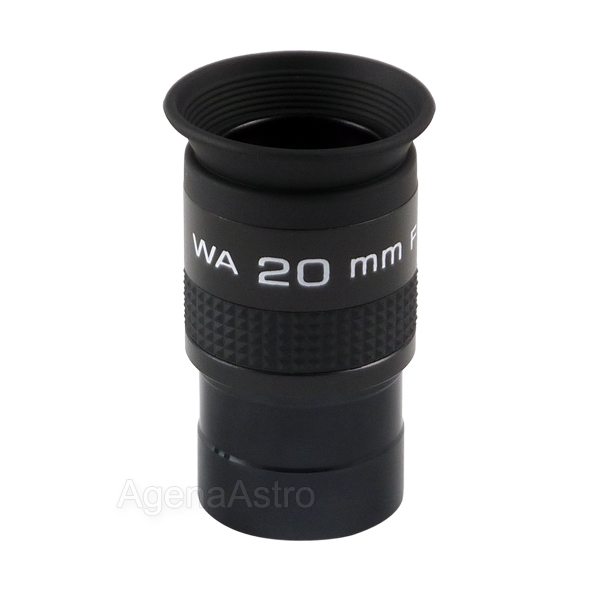 So if you're in the market for a 20mm eyepiece for under $50.00, check out the Agena AstroProducts WA 20mm. 2. William Optics SWAN 20 mm 72-degree AFOV (see my review for more info). 3. Celestron E-Lux 25 mm 52-degree Plossl (see my review for more info). **4-inch APO F/8 with and without Powermates and with and without Binoviewer. **3-inch Orion ST80 F/5 without Powermates and without binoviewer. ***Agena AstroProducts WA 20: Price about $45. This is fully multicoated and has blackened lens edges....THAT ARE REALLY BLACKENED!! It comes with end caps and bolt cases. The quality of the glass and coatings seems excellent. The eyepice housing is basic. The barrel of the eyepiece is a chrome type with no safety groove or sloped design. Some dislike the safety groove, others prefer it. The eyelens (the lens closest to your eyes when viewing) is recessed in the housing a bit...this helps protect it from scratches but also makes it a bit more difficult to use with eyeglasses, and with glasses on you can't see the whole field of view....but you get most of it. No internal reflections, and no scattering of light from the eyepiece barrel (when looking through the eyepiece while holding the nosepiece or barrel towards a bright source of light). There is also no ghosting. NOTE: Because of the need to use glasses, I will try the Agena SWA 20 (which is probably similar in design to the SWAN) and if quality is good for the Agena, I will get rid of the SWANs.